Katherine Arden’s Winternight Trilogy have been some of my favorite fantasy books in recent years, and I find myself recommending them to friends and readers everywhere because of their world building, their characters, and the fairy tale qualities upon which each book explores. The first book, The Bear and the Nightingale, has a slower start that builds into a magnificent, magical Russian setting. The second book, The Girl in the Tower, continues Vasya’s story and sets up for the satisfying conclusion in The Winter of the Witch. 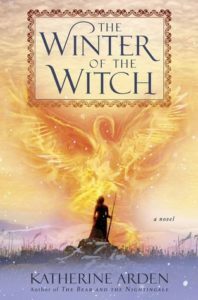 I loved the intersection of fantasy and Russian history, the strength of the female characters, the quiet scenes interspersed with the highly emotional or violent scenes. I thoroughly enjoyed the relationship between Vasya and Morozov, because their dynamic is a deep, dark, frisson. The scenes between Vasya and Morozov are intense and beautifully written, and I wish there was more about him, too. Vasya by herself, this time, seemed to be a little distanced from the character in the first two books, but I also wonder that it’s because she has been through so much that she’s in dissonance from herself, too. 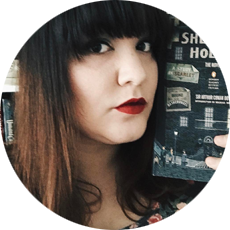 Overall, I was highly satisfied with the story, and I think it’s rare that the third book in a trilogy holds up and is even better than the first two installments. It’s an excellent meld of fantasy and history and how a single person can unite a country, for better or worse. Thank you to Netgalley and Del Rey Books for a review copy! All opinions are my own. 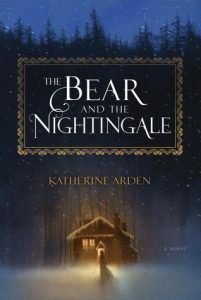 Katherine Arden’s The Bear and the Nightingale is a superbly magical fairy tale inspired by Russian folklore. The story is lyrical and engaging, and even though I’m not a reader who is familiar with Russian fairy tales and folklore, so much of it seems both familiar and strange that I felt like this story has both been part of that fairy tale lexicon of sorts and wholly new all at the same time. I love it when a writer weaves together the old and the new to make a new effortless-feeling tale that lingers in the mind long after the book ends. Vasya, the main character, is lively and complicated, as fairy tale heroines often tend to be. Arden’s villains are nuanced and complex, making you think that perhaps villainy is only a construct of our perspectives rather than a factual thing. The atmosphere feels like a chilly Russian wilderness, and its distant enough in time and distance to be all the more enchanting. And, like many traditional, “original,” fairy tales, The Bear and the Nightingale is beautiful and terrifying in a very Neil Gaiman-esque sort of way, and I love the sort of terror that sneaks up on you and faces you full-on, making you come to terms with the terror of your own reality in contrast to this fairy tale one. If you are a fan of Erin Morgenstern and Neil Gaiman and enjoy reading terrifically beautiful fairy tales, this is one you need to add to your TBRs immediately! Thank you to NetGalley and Random House/Ballantine for a review copy!